Help is at hand! 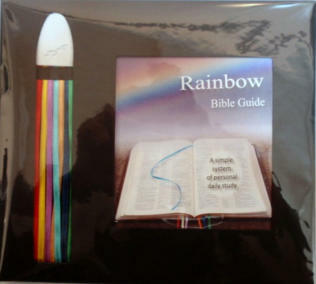 Based on the Bible’s own structure the Rainbow Guide uses a simple chart and seven ribbons for your daily reading. There are 7 types of literature in Scripture, 7 days of the week, and 7 colours of the rainbow! Using the ribbons, you read a different part of the Bible each day: Mondays, the red ribbon, the Law; Tuesdays, orange ribbon, the Gospels, etc. How does it work? Just slip the marker tab into your Bible’s spine or cover. No glue needed! The chart shows what to read when. The booklet explains the Bible’s structure, how to use the ribbons, and how to study effectively. Great revelation This refreshing new way brings great revelation to the WHOLE Bible without being bogged. Even the obscure bits come alive!